Seafood soup helps cure cabin fever on long winter nights, warming both the belly and the soul. Whether a cioppino, a boulibaise or a chowder, a bit of the brine in the mix adds to the meal. Bisque is perhaps the highest evolution of the seafood soup. If you’re a purist, you know that a true bisque is a seafood soup, but it is often used to describe any creamy soup. The soup is French, and the origin of the word “bisque”might be derived from Biscay, as in The Bay of Biscay, a gulf which lies off the west coast of Europe, bordering Western France and Northern Spain. 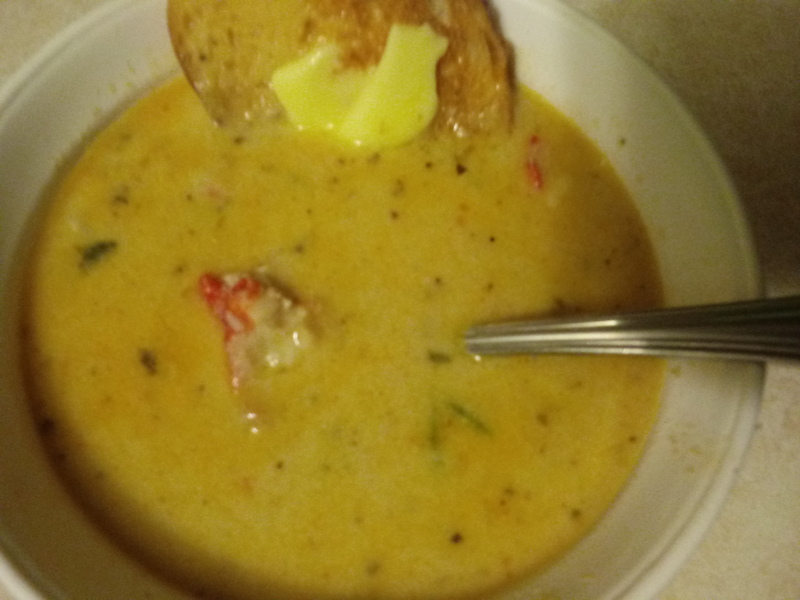 While lobster bisque is usually the first thing you’d think of, this seafood bisque is made with crab and shrimp, but you may choose to substitute another seafood or add a third, such as scallops, or firm, flaked fish like cod or monkfish. Saute veggies and garlic until soft. Add flour to roux. Add stock, pepper, tomato paste and sherry. Let simmer for 30 mins. Fold in milk and cream stir until blended evenly. Add seafood and cook for five mins. Add butter. Turn off and let sit for ten minutes. Serve warm with toast points, biscuit or crackers.